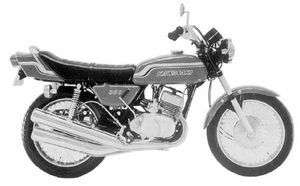 The Kawasaki S2 is a 350cc, triple cylinder, two stroke, street motorcycle manufactured by Kawasaki from 1972 through 1973. After Honda's great success, it was difficult in the late Sixties for a new Japanese marque to create an image for itself. Kawasaki, however, succeeded brilliantly in establishing a reputation as an exclusive specialist in high performance motorcycles. Kawasaki has hung on to its reputation in racing, even though its model lineup has widened. 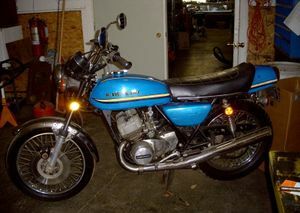 The 350cc version of Kawasaki's line of three cylinder sports machines was a really popular bike in Europe, where in the US, the 500cc H1 was the favorite. A little less demanding to ride the S2 was still very fast, but also had a great thirst for gasoline. Billed in Britain as "the most powerful production 350cc machine ever built", it gave incredible performance for the dollar. 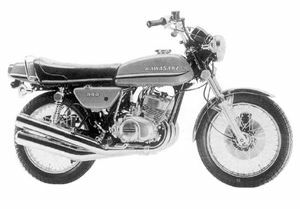 It all began in 1969 when Kawasaki introduced the 500 H1, a three-cylinder machine with terrifying acceleration that gave a new dimension to the concept of sporting bikes. Then Kawasaki's French importer, Xavier Maugendre, had the vision to form the Kawa-Godier endurance racing team, which finished first and second in the 1974 Bol d'Or and went one better in the 1975 event by coming in first, second, and third! In 1971, Maugendre, a dyed-in-the-wool racing enthusiast, inaugurated the "Coupe Kawasaki-Moto Revue," a one-make formula that would be copied all over Europe. 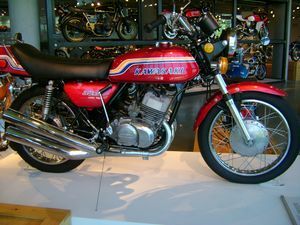 Initially, the Coupe Kawasaki was based on the 350cc Avenger twin but enjoyed its greatest success from 1972 on, when the formula centered on the three-cylinder S2 350. This was derived from the famous 500 H1, probably the most explosive motorcycle of its era, and -though it performed better on a circuit than on the road -the S2 was a little more "civilized" than the H1. Remarks: Very similar to the 250 cc Kawasaki S1, except for engine displacement. Can be identified positively by the engine or frame number prefix. Major Changes: Color, marking, seat, and front fork. Disc brake put on front.